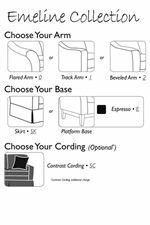 The Emeline Customizable Chair and Ottoman by Best Home Furnishings at Best Home Furnishings in the St. Louis, Chesterfield, St. Charles, MO & Waterloo, Belleville, Edwardsville, IL area. Product availability may vary. Contact us for the most current availability on this product. Emeline Custom Ottoman 1 25.75" 21.75" 18.5"